I ran into an interesting situation today when working with Office 365 Groups related to how they are named that I wanted to share. 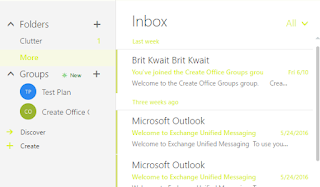 I had heard that there could be a name conflict that occurs between an Office 365 Group and a SharePoint Online site collection, so I wanted to test this out and understand the user's experience. Big thank you to Brittany Kwait who contributed to testing these scenarios! 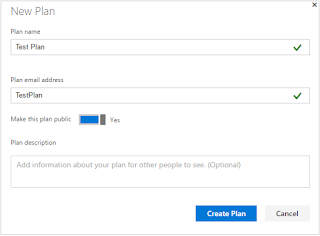 UPDATE 1: In working with the new Microsoft Planner, which was recently released as a new Office 365 experience, you'll also find that it creates an Office 365 Group as part of a new plan. 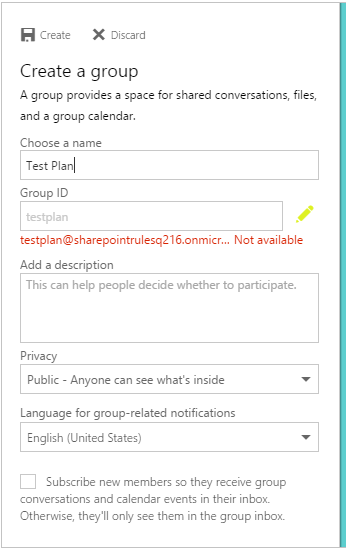 See below for some additional context into how Office 365 Groups are created and named as part of a Plan. UPDATE 2: Microsoft recently announced here that new administration capabilities are coming to Office 365 Groups, including the ability to configure a Naming Policy in Azure Active Directory for Office 365 Groups. According to Microsoft, this policy will allow administrators to configure a policy for appending text to the beginning or end of a group’s name and email address no matter where the group is created. As well, administrators will be able to configure a list of specific blocked words that can’t be used in group names and rely on the native list of thousands of blocked words to keep their directories clean. This feature is still roadmap and there isn't a committed timeframe yet for release, but I'm hopeful that it will help to address some off the naming experience inconsistencies. 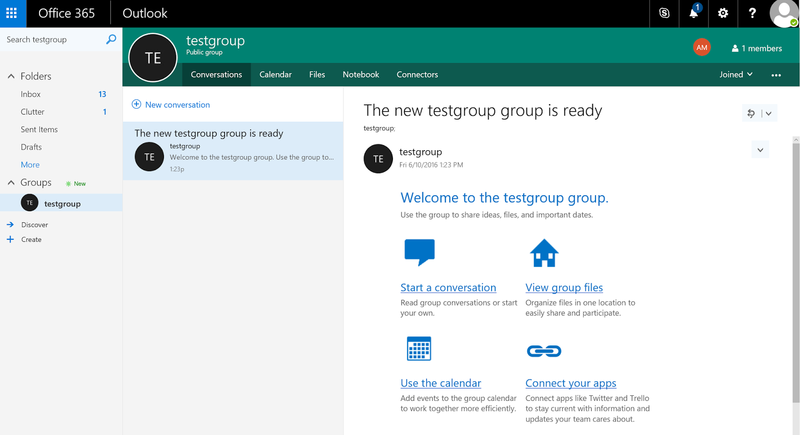 Within the Office 365 portal I accessed by mail using the Outlook Web App and I created a new Group named "testgroup". 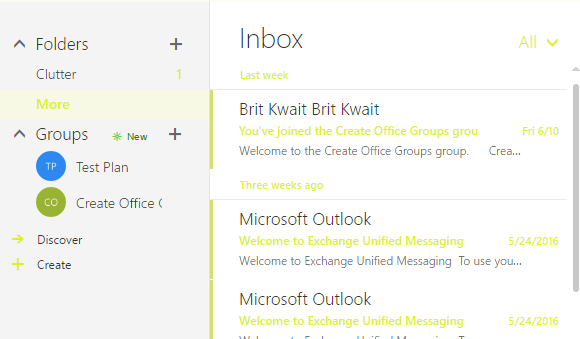 I did not click on Files right away in the Office 365 Group interface. I left my shiny new Group and navigated to the SharePoint Online admin console. Here I created a new site collection and named it "testgroup" and gave it the URL https://maiolabs.sharepoint.com/sites/testgroup. Everything worked fine! My site collection was created without issue or error, using the name I gave it, which is the same as the Office 365 Group name I had chosen. Where was the conflict? I navigated back to my Group, and this time I clicked on Files. At this point, I immediately got the screen which tells me "We're setting up...". After a few minutes I got access to the space that was being created within the Group to store my files. 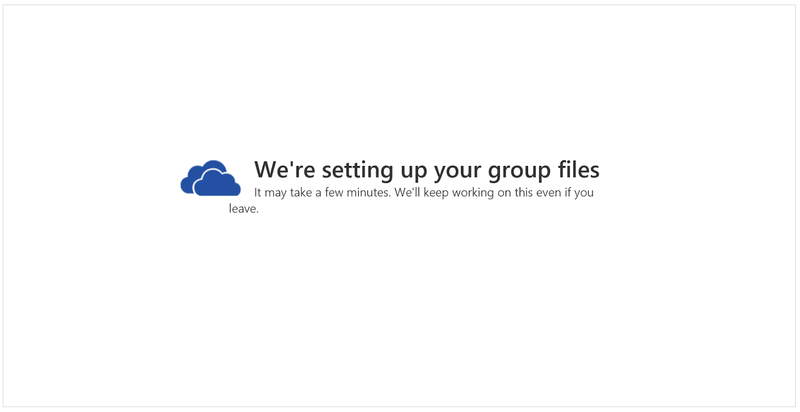 Of course, when an Office 365 Group is created, a OneDrive for Business site collection is created in which group members will store their files. Now I began to understand what was going on. The site collection associated with the Group does not get created until you click on the Files tab in the Group interface. Its important to also note that the OneDrive for Business site collection that gets created in this case is a hidden site collection. Notice the URL doesn't say "testgroup"? It says "testgroup53". I found that interesting but nothing conclusive yet. The site collection already exists. Please enter a different address. As I continued through the process, it was fine for the site collection name to be the same as that of an Office 365 Group. However, the site collection cannot have the same URL as the OneDrive for Business site collection that is associated with a Group. This makes sense - whenever an Office 365 Group is created and its OneDrive for Business site collection initialized, a OneDrive for Business site collection is created within SharePoint Online and of course you cannot have the same URL pointing to 2 different site collections. Its interesting to note that if a site collection already exists with a particular URL and I then click Files in a Group to initiate my Group's OneDrive for Business site collection, Office 365 Groups will alter the URL so that it is unique and doesn't conflict with any site collections. However, this doesn't happen the other way around - if I create a site collection with the same name and URL of an existing Office 365 Group, I get an error and no automatic modifications to the site collection's URLs are made. This also makes sense - we often want our SharePoint site collection to have a specific URL. What could be improved is the fact that the OneDrive for Business site collection associated with a Group is hidden. 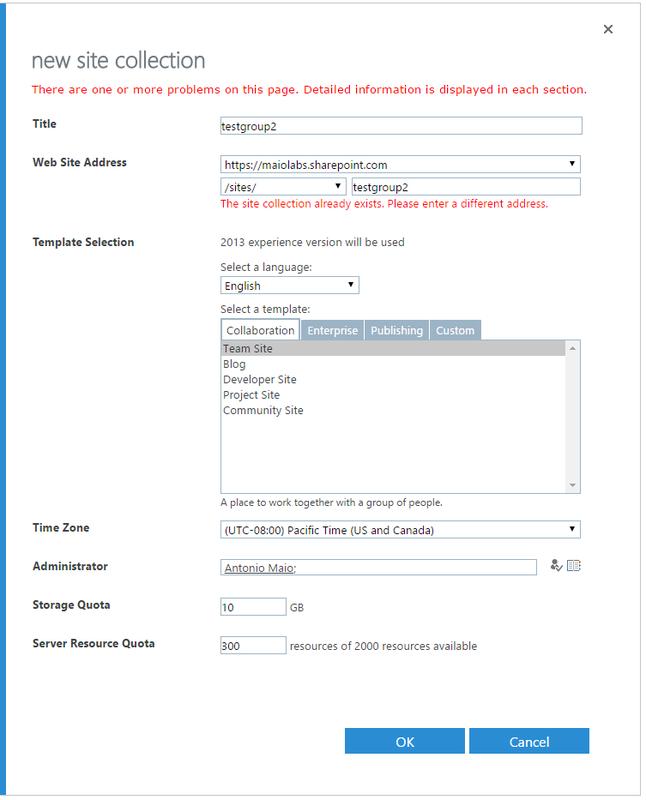 To a SharePoint Online admin who is simply trying to create a new site collection, they may get this error and look at the list of site collections to see which other site collection has the same URL and not see any in their list which conflicts. Yes the SharePoint admin can simply alter the URL, but they may want the URL to be something specific. This may also cause them to spend significant time investigating the issue and open a support ticket with Microsoft. This situation could be made even worse by the fact that, once Groups are enabled in your organization and by default everyone in the organization can create one or multiple Groups, you'll end up with many hidden site collections with no control over how they are named. So the possibility of a conflict between an existing Group URL and a new site collection could be high. This is especially true if you get a significant adoption of Office 365 Groups and also use SharePoint Online site collections. 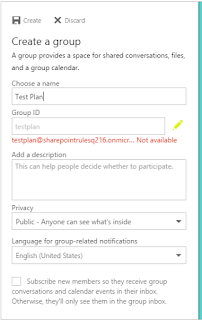 I am encouraged by the fact that, as announced on May 4, later this year Microsoft will be launching the ability to associate a real SharePoint team site with an Office 365 Group. With that, I'm hopeful that SharePoint Online admins will get real visibility into which sites are associated with which Office 365 Groups, and avoid this naming/URL conflict. Microsoft recently released a new service within Office 365 called Planner. Planner allows teams to quickly organize, plan and track work projects and tasks using a highly visual experience: a task board that you might be familiar with from Agile/Scrum methodologies or solutions like Trello. 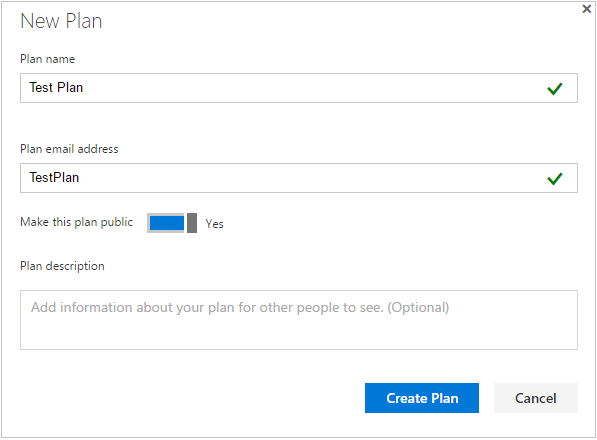 In using Planner, when you create a new "Plan" Planner will automatically create a new Office 365 Group that will be associated with the Plan. The Group will be named the same as the Plan. Here we get another interesting inconsistency - if you remember, when we tried to create a Group that was the same name as a site collection, the URL was simply automatically adjusted to be unique as part of the Group creation process. No error appeared. When we try to create a Group now that's the same name as a Plan, we get an error. The same will probably happen if we try to create a Group that's the same name as another Group. These aren't major issues - I just find it nice to know about and expect the inconsistency. Once again, my point here is that I hope in the future, the new features we are told are coming for Office 365 Groups (Naming Policy, Team Sites associated with Groups) will help us control naming, and have Groups, Plans and site collections all work well together for administrators and end users. Enjoy your Groups! ...and Plans! Thanks for confirming. Just ran into this issue and you are right, quite frustrating to have hidden site collections that can't be seen within Site Collection list.